“The history of the U.S. Constitution we weren’t taught in school”, first published here in 2012, has turned out to be one of my most popular posts. I thought a repeat this holiday week would be appropriate. If you’re like me, I learned in grade school that the U.S. Constitution was based on ancient Greek democracy. Which was a creative stretch of the truth, since ancient Greece was not a democracy. My research as to what children are taught today about the origin of our government is also disappointing, although there are some states that have updated the teachings to include Native American influence. Apparently the Founding Fathers simply created it out of thin air, or were influenced by European governments even though there was no democracy anywhere in Europe at that time. The truth is that the U.S. Constitution is modeled in both principle and form on the Great Law of Peace of the Native American tribe known as the Iroquois. This is absolutely, unequivocally historical fact. While there may have been other influences, when compared side by side, the influence of the Great Law of Peace is irrefutable. In 1987, the United States Senate acknowledged that the Great Law of Peace of the Iroquois Nations served as a model for the Constitution of the United States. (U.S. S. Con. Res. 76, 2 Dec. 1987). And since the U.S. Constitution was a model for the charter of the United Nations, the Iroquois Great Law of Peace is also a basis of international law. When the Founding Fathers looked for examples of effective government and human liberty upon which to model a Constitution to unite the thirteen colonies, they found it in the government of the Iroquois Nation. In the 12th Century, five tribes in what is now the northeastern U.S. were constantly at war: the Mohawks, Seneca, Oneida, Onondaga and Cayugas. The wars were vicious and, according to tribal history, included cannibalism. One day, a canoe made of white stone carried a man, born of a virgin, across Onondaga Lake to announce The Good News of Peace had come and the killing and violence would end. He traveled from tribe to tribe over the course of years, preaching peace because peace was the desire of the Creator. Oral tribal history says it may have taken him 40 years to reach everyone and get agreement from all five tribes. This man became known as The Peacemaker. Eventually, the five tribes agreed to the Great Law of Peace and became known collectively as the Haudenosaunee, which means People of the Long House. Outsiders refer to them as Iroquois. [In 1722, the Tuscarora joined the Confederacy so today it’s known as the Six Tribes of the Iroquois Confederacy]. The Great Law of Peace was a vehicle for creating harmony, unity and respect among human beings. Its recognition of individual liberty and justice surpasses that of many democracies. checks and balances within government. A Women’s Council, which is the Iroquois equivalent of our Supreme Court –settling disputes and judging legal violations. The central idea underlying Iroquois political philosophy is that peace is the will of the Creator, and the ultimate spiritual goal and natural order among humans. For decades, the Iroquois had urged the English colonists to unite together as one independent and free people. George Washington, Ben Franklin and Thomas Jefferson met frequently with the Iroquois and made themselves very familiar with the Great Law of Peace. Washington expressed “great excitement” over the two houses and Grand Counsel. Several delegates from the Iroquois Confederacy attended the Continental Congress in 1776 as it wrote the Declaration of Independence and drafted the Constitution of the United States, modeling it on the Iroquois Constitution. Three weeks later, the Declaration of Independence was signed, and the United States of America was born. The Seventh Generation principle: The Constitution of the Iroquois Confederacy states that chiefs consider the impact of their decisions on seven generations into the future. The role of women: Clan mothers choose candidates [who are male] as sachems [political leaders]. The women maintain ownership of land and homes, and exercise veto power over any council action that may result in war. The women can also impeach and expel any leader who conducts himself improperly or loses the confidence of the electorate; then the women choose a new leader. The Peacemaker designated The Tree of Peace as a symbol of the Great Law of Peace — a great white pine tree whose branches spread out to shelter all nations who commit themselves to Peace. Beneath the tree the Five Nations buried their weapons of war. Atop the tree is the Eagle-that-sees-far. There is a bundle of five arrows tied together to represent strength of five tribes bound together in peace. Thomas Jefferson adopted the symbols of the Peacemaker legend. The Tree of Peace became the Liberty Tree displayed on colonial flags. 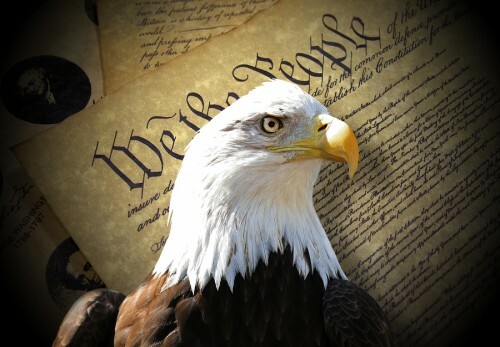 Eagle-that-sees-far became the American Eagle, still a symbol of American government. 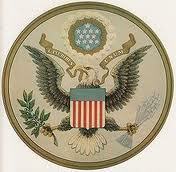 On the U.S. Great Seal, the American Eagle clutches a bundle of thirteen arrows, representing the original colonies. There’s no separation of church and state in Iroquois society; spirituality lies at the root of government and law. 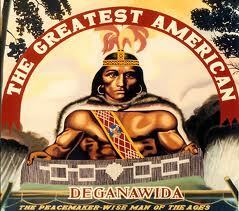 However, the Iroquois Confederacy, as with most tribes, had separate leaders for war and peace. As a lawmaker, the sachem could never go to war in his official capacity as sachem. If disposed to take the warpath, he laid aside his civil office for the time being, and became a common warrior. The colonists followed this model, too. The inability to separate the civil government and military has doomed many imitators of American democracy, particularly in Africa and Latin America. It’s the omission of these three principles, the seven generations rule and the role of women that cause Native Americans today to say that, the United States Government copied the Great Law of Peace but didn’t really understand it. So our forefathers copied the Great Law of a people whose land we stole and against whom our government committed genocide, and then kept it a secret for two hundred years. Please teach your children the truth of the history of our great country. U.S. S. Con. Res. 76, 2 Dec. 1987. Chapter 8 in “Indian Givers; How the Indians of the Americas Transformed the World” by Jack Weathorford [Crown Publishers, 1988] and related bibliography.